I’ve been up to all sorts this past year – a script for Fox TV, writing on the new Assassin’s Creed Syndicate, enjoying a gig as Artist in Residence at BBC Comedy, popping up on TV and radio, handing in my 400th ShortList column, and some other stuff too. Coming up, the FX network in the States are prepping a new JOIN ME project, from the guys behind the excellent You’re The Worst. 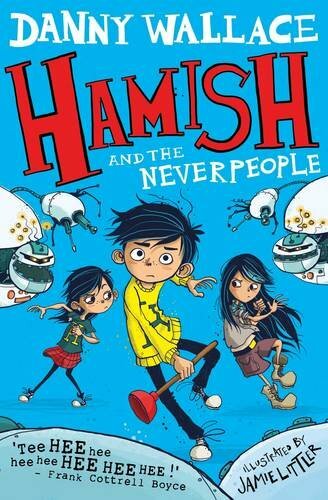 And this year I’ll be starting a couple of secret things, a new podcast for something exciting, writing a new book for grown-ups, and releasing this… the second Hamish adventure for kids. In this one, Hamish discovers a whole new world of people just like us… while being the complete opposite, too. I hope if you have kids they’ll enjoy it. Look out for the TV ads! Pre-order a copy right here, and it’ll be delivered on day of release! I’m also delighted to say that the first book’s been chosen to be read by the kids of Brighton, in their brilliant Young City Reads scheme. Can’t wait to get down there.